Although these settings are not very important but adding or enabling the Google Analytics is very important. 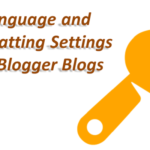 We will discuss all of the above settings so that you can understand what these settings are and what are their roles in our blogs? Import and back up is the first option in the “Other” settings. There are two buttons below the “Import & back up” one is Import contents and the other is Back up contents. Import Contents: If you have some contents and want to import then to your then blog then you can easily import them, The main purpose of this button is when people transfer their blogs from other Blog-Publishing services to Blogger. Back up Contents: This option is for taking the back up of your all content such as comments, posts etc. If you want a backup simply click on the Back up button and download the backup files to your computer. This option is for deleting your blog and all of its contents from the Blogger.com. If you want to delete your blog then click on the Delete Blog button and select “Delete” in the new popup your blog will be deleted but I recommended you to download a backup of your contents before you push the Delete button. Remember once you delete you blog you can get it back in next 90 days but all of its contents will be lost. Site Feed means how your new posts will be delivered to your subscribers. When someone subscribes to your newsletter using his/her email he/she receives a newsletter email when you have a new post. This option is to decide which part of your post will be sent through the mail. There are four options I recommend to set it on “Short” it mean when you have any new post only the title and description of your new post will be delivered to the subscribers so that if any subscriber likes your new post then he has to click on the link and come to your site. But if you set this option to “Full” then your full post will be emailed to your subscribers so they can read all the post in the email and they do not have the need to visit on your site. This can reduce your visitors. Now if you are using Feed burner for managing your feed then leave this blank, but if you are using any other service then enter the URL of Post Feed that your service will provide to you. All the subscribers and feed data will be delivered to the new link which you will provide here. You have published a new post that post will be mailed to your all subscribers but when you subscribers will open the mail they will find just some details about the post such as Title and Description etc. if you want to add some Advertisement, images or buttons at the bottom the newsletter mail then you have to add that code in this field. Now when you will publish any new article which will be delivered to your subscriber will have the options which you have added through Post Feed Footer. Title links are the links associated with the Title of your blog post but by default blog post have not title links you have to add them manually to get more internal linking of your site. For your understanding, if you want to change the URL of your post’s title then you can add that URL in the Title link field while editing the post. When you publish an article using Blogger your article is in the form of Atom like RSS feed. If you add Podcast media in a post then normally that cannot be readable for the RSS feed. As you know Blogger post is in an atom so podcast media cannot be read by podcatchers so enclosure link is used. Open ID is a network which is mostly used by website owners to give access to different sites to manage your site. It is same on Blogger there is a field to add some links. Add a link to any site which you trust now that site will be able to take some actions with your blog. Adult Contents mean if you have some contents which are not for children for example if your blog is related to Biological topics which are not for children or you have some sexual contents then enable this field. By enabling this visitor will see a confirmation message that this site contains Adult contents. Google Analytics is just another service of Google for the website owners. Webmasters have to create an account on Google Analytics and paste the code in this field or directly to their blog template. Now when the code is implied the webmaster will be able to see the details about the traffic of his blog (Site) i.e. from where the visitors come, the main source of visitors, from which country the visitors are etc. Basically, these things are technical and no one wants to learn these things because they just want to earn money instead of getting knowledge. But these things are necessary for everyone because if you can’t know about these basics, you’ll not become a pro in marketing. These techniques helps us to perform better in Google’s eye so it can rank out blog or site in better way. These basics are quite tough but once you’ll practice them, i am sure you can easily do them in your next blog. 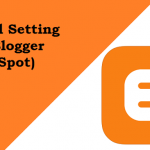 So, i suggest you to must practice about these settings of blogger and i am sure you’ll learn about everything about blogger. You just want to have focus on these settings because if you done it wrong, this will effect your blog in Google search engine. I assure you that you’ll soon realize its worth because these settings helps you in your entire life. You just have to learn them 1st time and then you can do them easily and without anyone’s help. Just follow the above steps and you’re done. You can practice them in your spare blogs and once you done them right, you can do changes on your money site. Blogger is quite different from other platforms but you can learn a lot of things from this platform. 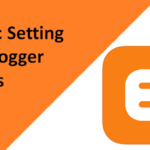 This was our guide about blogger’s extra settings i hope you’ll like them. Share this post with your struggling friends and other loved ones and try to help them out. You can also clear you any confusion from us in the comment section. We’ll try to reply you as soon as possible. Good luck.